Turkey suggests ISIS to blame for Ankara bombing that killed 128: The worst terrorist attack in modern Turkish history comes at a very dangerous time. 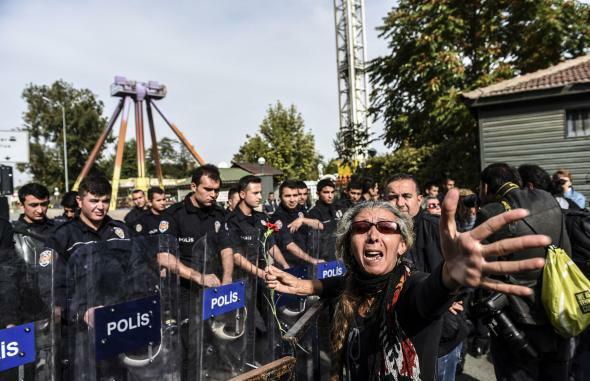 A woman reacts near a row of police officers blocking the way to the site of twin bombings during a rally to remember the victims in Ankara, Turkey, on Oct. 11, 2015. So far, the aftermath of the worst terrorist attack in modern Turkish history has followed the normal script of attacks in the country: No one has taken responsibility, and everyone is blaming everyone else. The Turkish government says ISIS is the prime suspect in the twin bombings that killed at least 128 people at a rally in the Turkish capital, where protesters were gathered to demand an end to violence between the government and the Kurdish separatist PKK militants. However, Prime Minister Ahmet Davutoglu also said that the government hasn’t ruled out the involvement of the PKK itself, or of the radical leftist groups that have carried out attacks in the country in recent months. President Recep Tayyip Erdogan compared the bombing to other recent attacks by the PKK in a statement calling for national unity and launched new airstrikes on the group’s positions in southeastern Turkey and Iran on Monday. * The Turkish government, which has been heavily criticized for censorship and the jailing of journalists, imposed a news blackout on “gruesome” images of the blast. Meanwhile, anti-government protests were held throughout the country over the weekend, with many blaming the government of either orchestrating the attack or creating the conditions that led to it by whipping up anti-Kurdish sentiment and not doing enough to fight ISIS. After months of dragging its feet, Erdogan’s government agreed to join the U.S.-led coalition against ISIS in July, and its participation is a key component of the Obama administration’s new strategy for combating the group in Syria. But Erdogan’s critics, particularly Kurds, say he is simply using the anti-ISIS campaign to get international cover for his campaign against the PKK. After years of promising talks, the peace process between the government and the Kurdish separatist rebels have largely broken down. Turkey’s involvement in Syria is contradictory—which to be fair, is hardly unique in this conflict: While it plans a campaign against ISIS, it’s also fighting a war against the Kurdish militias that have been ISIS’s most effective foes. What made last weekend’s attack unique was not only its size but also its location: in the heart of the Turkish capital rather than deep in Kurdish territory or along the restive Syrian border. The current political stakes also couldn’t be higher or more complex. Turkey is holding a snap parliamentary election on Nov. 1, with Erdogan and Davutoglu’s moderate Islamist AKP hoping to regain a parliamentary majority. Turkey has had an interim government since the election held in June in which the AKP lost its parliamentary majority creating a hung parliament. The election also saw the leftist, Kurdish-dominated HD party government elected to parliament for the first time. The days before that election also saw a deadly bombing at a pro-Kurdish rally. The AKP hopes that the new elections will allow it to regain control and push through constitutional changes that will expand Erdogan’s executive powers. If it fails again to win a majority, it would be a major rebuke to the party that has dominated Turkish politics since 2002. The optimistic view of this is that Erdogan’s authoritarian ambitions have been checked, but there are also fears of a return to the level of political violence that wracked the country in the 1970s and ’80s. Back in 2010, before the upheavals of the Arab spring and Erdogan’s slide toward authoritarianism, the AKP’s moderate, democratic brand of Islamism was viewed internationally as a welcome corrective to decades of military-dominated politics in Turkey. Davutoglu, then foreign minister, famously described the country’s foreign policy doctrine as “zero problems toward neighbors”: The AKP could talk to governments in the West as easily as it could old-school Arab monarchies, the Muslim Brotherhood, or Iran. Today, the government of “zero problems” appears to have nothing but. *Correction, Oct. 12, 2015: This post originally misspelled President Recep Tayyip Erdogan’s middle name.